What Is a JOBOPTIONS File? A file with the JOBOPTIONS file extension is an Adobe PDF Preset file. Adobe products use a JOBOPTIONS file to define the properties of a PDF file that's to be generated. Some of the settings that might exist in a JOBOPTIONS file include the PDF's fonts, image resolutions, color schemes, and security settings. Older versions of Adobe products save PDF presets as files with the .PDFS file extension instead of .JOBOPTIONS. Acrobat Distiller is responsible for creating PDF files, and so it, of course, can open and properly utilize JOBOPTIONS files. Also, because PDF support is integrated in Adobe Creative Suite programs, any of those programs, like InDesign, Illustrator, Acrobat, or Photoshop, can also be used to open JOBOPTIONS files. In Photoshop, for example, opening a JOBOPTIONS file can be done via the Edit > Adobe PDF Presets... > Load... option. Similar steps can be taken with other Adobe tools. Try the File menu if you can't find it in the Edit menu. JOBOPTIONS files are text-only files, which means you can also open them with a simple text editor. Keep in mind, of course, that using an editor like Windows Notepad or Notepad++ just lets you view the instructions that the JOBOPTIONS file contains - you won't actually be able to use the file to define the creation of the PDF like the programs we mentioned above can do. Some JOBOPTIONS files are provided in a ZIP file, which means you must extract the file out of the archive before you can use it with an Adobe product. If it's in a different archive file format, and you're having trouble opening it, try using an archive decompressor like 7-Zip. If you find that a program on your computer tries to open the JOBOPTIONS file but it's the wrong application, or if you would rather have another installed program open JOBOPTIONS files, see our How to Change the Default Program for a Specific File Extension guide for help making those changes. 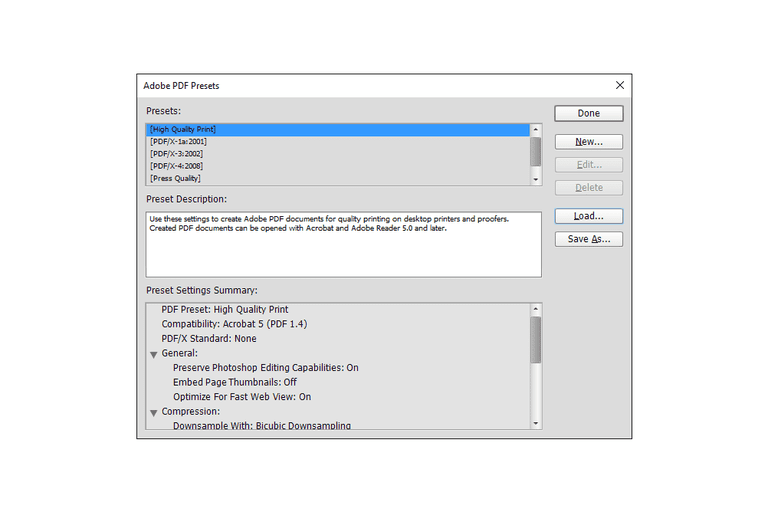 Older versions of Adobe InDesign use the .PDFS file extension to store PDF presets. This older format can be converted to .JOBOPTIONS if you import the PDFS into InDesign CS2 or newer and then export/save it. You can read more about this from Adobe's Export to Adobe PDF tutorial. We don't know of any reason to convert a JOBOPTIONS file to any other file format because doing so would make the file unusable as an Adobe PDF Preset file. However, like we mentioned earlier, since the file is really just plain text, you could open it in a text editor and then save it back as a TXT or HTML file. This might be handy as a way to store the data for reference, but not for actual use. New JOBOPTIONS files that you import into an Adobe product are stored in the C:\ProgramData\Adobe\Adobe PDF\ folder, at least in newer versions of Windows. In Windows XP, this location is C:\Documents and Settings\All Users\Application Data\Adobe\Adobe PDF\. macOS stores .JOBOPTIONS files in this folder: /Library/Application Support/Adobe/Adobe PDF/. If your file doesn't open with the suggestions from above, then it's likely that you're misreading the file extension and don't actually have a JOBOPTIONS file. One of the closest file extensions to this one is .JOB, which can be used for both MetaCAM Nest Job files and Windows Task Scheduler Job files, neither of which are related to PDF files or used with an Adobe program. If your file has the .JOB suffix instead of .JOBOPTIONS, it might work with a Metamation program or the Task Scheduler program built-in to Windows. Task Scheduler related JOB files are stored in Windows at C:\Windows\Tasks, but some programs might use the .JOB file extension for their own purposes, like to run scheduled virus scans or auto-update their program and keep the file elsewhere.